Maybe you’re wishing you could invite The Nester into your space. 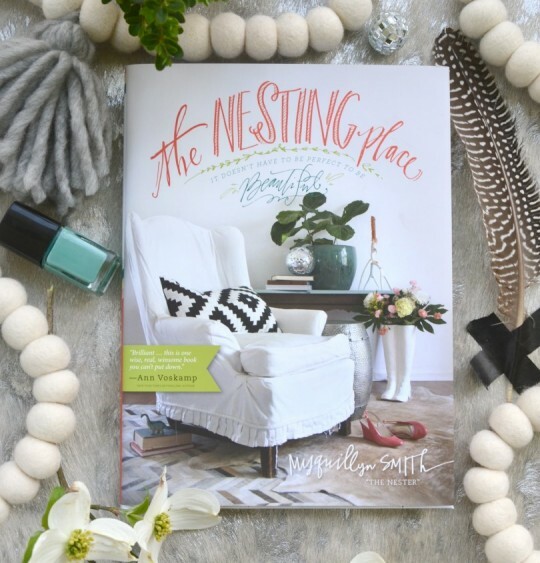 Unfortunately, there aren’t enough Nesters to come into everyone’s home, but you can buy her amazing book, The Nesting Place, for help with all of your decorating needs. It’s so easy to understand – I feel like she jumps right out of the pages and into my space. Stay tuned for one more post tomorrow on the finished room. I promise you don’t want to miss the big reveal! Today, I’m giving away 3 signed copies of The Nesting Place. To enter, leave a comment below telling me which room in your home you’re going to tackle with all the new tips you’ve learned this week. We are moving into a brand new home in a month. I am so excited to start making it fit our lives. I have a small nook that I will be making into my creative art space. I can’t wait! I’m moving to a new house in a new city! The whole house needs work! It’s stuck in the 70’s!! Would love your book to help me! The master bedroom. I’ve had an idea in my head for a while know, but have been unable to pull it together. I’ve gotten some great ideas of where to start! Our bedroom. It would be nice to have a retreat when life gets a little hectic. I would start with the master bedroom. Going to give our family room a make-over. We live four stories above a thrift store and I’m always browsing there for something. I like a little guidance though, thanks! My living room. It needs character. It’s very bland and uninviting, and then the kitchen! You have given me the courage to knock.out a wall (not a bearing one, lol!) We have been here for 6 years and we’ve never really had a “family room.” This is now my mission!! Thank you!!!! My living room. We painted last fall and hung new curtains but I have been stuck ever since. I still have nothing on the walls and I need one or two smaller furniture pieces to fill it in. I feel like the look I want is within my reach but somehow I can’t get there. Next up would be my master bedroom. It has been a disaster for far too long! I have a bunch of frames to paint for a feature wall in my bedroom….got to tackle that project! Love the empty the room idea. I did that in our dining room. Found things in other rooms that I didn’t really like in that room but is looking great in the dining room! Need to pick up a few new pops of color but loving the new look already! I think our living room needs the most help! We’re newly married too and is a mix-match of what we had individually. Can’t wait to try some of these tips! Our family “play room”–we have just combined houses (second marriages, both with children), and I would love to make this a cohesive room for all! My living room! It was in okay shape but now has too many thrift store, side or the road tchotchkes 🙂 and I need to move everything out again for a refresh. I’d love your inspiration for my whole home. The “doing” decorating is one thing, but your wonderful guidance and practical real life advice and lessons on how to trust yourself and have appreciation for the process while on budget and with regular life conditions is what’s valuable! Helping us become the best decorator for our own homes is a gift. Thank you!! Going to tackle the master bedroom! Desperately needs some attention! Thanks for the chance to win! I love reading your articles, I haven’t been really interested in decorating in the past, but you have really inspired me with these articles. Since my divorce my home has become like a prison of old memories, you have inspired me to begin in my bedroom. I am going to go nutz totally undoing old things and starting anew. Thanks for your inspiration just when I need it. I think I will hours of fun looking for things that fit just me again. We will be tackling our home office with these techniques. We recently emptied out the home office space and are now working to make it a family study space since all of us will be in school this fall (Husband and I are both going and my son is in 5th grade). My mother in law was going to get rid of two very comfy chairs that we are going to use. Now to figure out how to decorate around these focal points! So excited to find this series. Would love to transform our master bedroom. My tiny little home office needs some fun brought into it. I hope to carry inspiration into that room! We’re putting together our master bedroom. With a toddler pulling at us for all of his sweet needs, it will be nice to have an peaceful (to the eyes and mind) retreat to read and settle down from the business of life. We ordered a new sectional for our family room & the space will need some tweaks when it arrives! I have been doing a major whole house clean-out and declutter, so I could use this book to revamp the whole house once I’m done. I especially need help in my kitchen. Living room. Oh, the living room. My eye gets so used to the “stuff” and this is a great reminder that it needs to find a home or a ride out of here. our den. It is a room that actually needs to be gutted; walls and ceiling need to be repaired,removed etc. BUT we want to use it now until we can actually afford to do the rehaul. I like what you’re saying about inviting people into the imperfection. We are moving soon so i have a whole new home to think about but will most likely start with the kitchen. Our living room needs serious work since it holds many “treasures” from other rooms & thrift stores. It has become a huge mess and I need help! I’m here from Miss Mustard Seed blog. I am going to redo the playroom. We painted it 5 + years ago turquoise and brown. It is time for a change and time to clean it out! I took everything out today, can’t wait for tomorrow! I just re-painted my living room walls and will be painting my entry way this weekend. We have new carpet in the living room. So because our entry way and living room are in the same area, I’m going to tie those two spaces together!!!! So excited! I am so loving this series! I’m really needing to do something with my kitchen and my master bedroom right now. This is so encouraging! Would love to have the book! Thanks for the opportunity to enter the drawing. Could hear music on the video, but no voices. We are moving across the country and downsizing from our home in Alabama to an apartment in Seattle! I will be tackling the living room/eating area/kitchen in the new apartment with the ideas I have picked up today. They are not separate spaces in the apartment and kind of run together! Looking forward to getting started! I want to start with the family room…and then move on to the living room and then maybe a bathroom or my bedroom. My daughter just moved into her first real home and took her old bedroom set, so I no longer have a guest room. But my husband wants me to put more stuff on the walls in the living room. I want to work on both and not be afraid to put holes in the walls. I just started daycare and would love to be able to hide the clutter afterwards. I have been having thoughts of doing a moms bible study or bring back my preteen bible study group but I just can’t unwind we I see all the disorganization surrounding me. I would love to re-do my family room/living room. I love it, but would also like to refresh it!! Definitely the living room! I am right now throwing away all the clutter and organizing the book shelves. Then I will try to keep it as clean as possible! Thanks for the articles! I am a new fan of yours Lysa. I really enjoy reading everything you post. I’m very anxious to get to hear you speak at the Women of Faith conference in Indianapolis this fall. You have been a great inspiration to me as a mother.